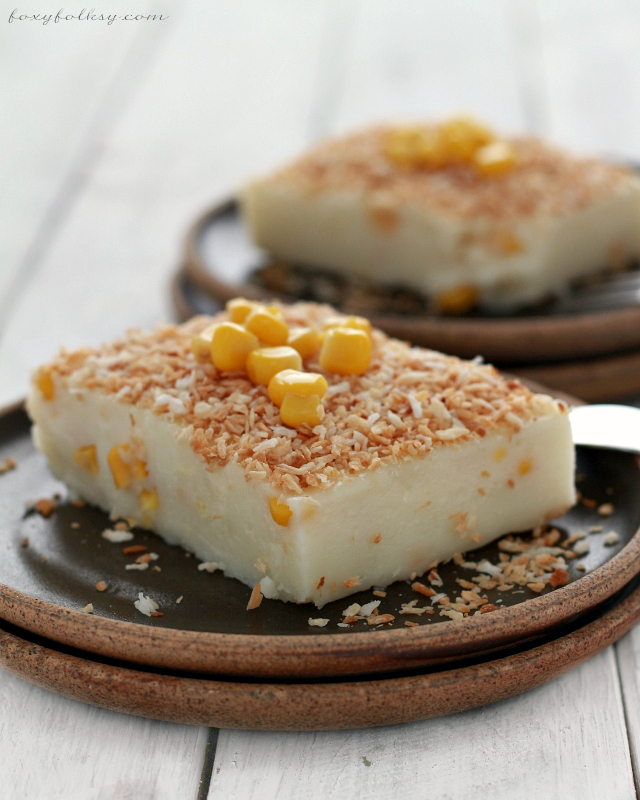 Try this quick and simple Maja Blanca recipe for a creamy, soft and light Filipino pudding made from coconut milk, milk, sweetener, and corn kernel. Maja Blanca is one of my personal favorite Filipino desserts. What I like best about it is the texture; soft and light. It is basically a combination of coconut milk, milk, cornstarch, and sweetener. You may add corn kernels to give some contrast. Some use sugar used as a sweetener but I opted to use sweetened condensed milk to make it creamier. The original Maja Blanca is topped with ‘latik’- that is what coconut milk becomes when simmered under medium fire for some time. This process will give you coconut oil and some brown solids, or ‘latik’ as we call it, which is common toppings for rice cakes and other Filipino desserts. Since I was pressed for time when I made this Maja Blanca for my friends’ visit and didn’t have time to make ‘latik’, what I did was, I toasted some dried coconut flakes in a pan until golden browned and sprinkled them on top of my Maja Blanca. I missed the latik but this sub is really good as well. Good thing they can be found easily here in German supermarkets so is the coconut milk in a can and other ingredients needed to make this delicious dessert. Try this quick and simple Maja Blanca recipe for a creamy, soft and light Filipino coconut pudding made from coconut milk, milk, sweetener, and corn kernel. Grease a (21x21cm) square pan with butter. Set aside. Combine coconut milk, milk and condensed milk in a pot and bring to boil over medium heat while stirring occasionally. Add the corn kernel. Pour in the cornstarch mixture and stir constantly and quickly until the texture turns into a paste-like consistency. Remove from heat and transfer to greased pan immediately. Gently tap the pan on the kitchen counter a couple of times to get rid of trapped bubbles and even out the surface with spatula or spoon. Let the Maja Blanca settle and cool down. Toast the coconut flakes in a pan over low fire until browned. Stir constantly to avoid burning them. Set aside. Sprinkle top with toasted coconut flakes. This is a bomb!! I made this for 5th time already and I received a lot of compliments. Thanks bebs for this great recipe. God bless you!! Yes, I used Maisstärke. It didn’t turn out to a paste like consistency and I thought it was going to harden once it cools down or placed in the Ref. It still turned out tasty anyway. A video would be appreciated! Thanks again Bebs! Btw, where can I get Buko Pandan ingredients here in DE? You can get frozen pandan leaves or the bottled pandan essence usually in the Asian stores. They also have sometimes fresh coconut or you can use the canned coconut meat from them as well. Hi Bebs! I’ve been looking for maja mais recipe, someone requested me to cook it for them. Your recipe will be my first try. I will give you feedback. Thank you so much. I hope you like it Madrely. Hi, I made this recipe and it turned out great! I didn’t have milk to dissolve the cornstarch in so I used the water from the canned corn. I chose this recipe since I noticed that there is no added sugar. Since we like mildly sweet desserts, this Maja Blanca was just right. Thank you! 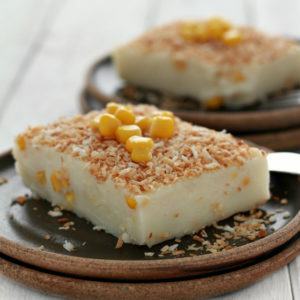 Have tried a few Maja blanca recipes online and this one is the best! Rich and creamy, just as we like it. Thank you, Bebs. All the best. I mixed in a handful of bittersweet chocolate just to experiment now it taste like between maja blanca and chocolate pudding. We still liked it. I’m a fan of your blog and it all started when I found your maja recipe last year! I even did peach pocket pies, pininyahang manok and so much more! Have a great day every day and I wish you more success! Thanks for the comment Gwen and super that you are loving the our recipes! Hi, I’m looking for the old-fashioned tibuk-tibuk. Do you have the recipe? Your recipe here is very nice but very rich. The tibuk-tibuk is almost like gelatin, simple and very refreshing. I know you are from Pampanga so you probably know what I’m talking about. Thanks in advance. You can email me directly. Hi Leah, Yeah I know what you mean. Tibuk-tibuk or Tibok-tibok is the Kapampangan version and it is made from carabao’s milk. It is firmer or like you said gelatin-like. I love Maja Blanca but I prefer Tibok-tibok over it anytime. We will be moving to Philippines very soon, to my hometowm, so I will put this in my list for now when I can get hold of carabao milk. But I will also look for a close alternative for those who cannot get carabao’s milk in their place…???? Hi, what is the equivalent of 1 cup to grams and if liquid to ml? I’m in italy and we don’t use cups. 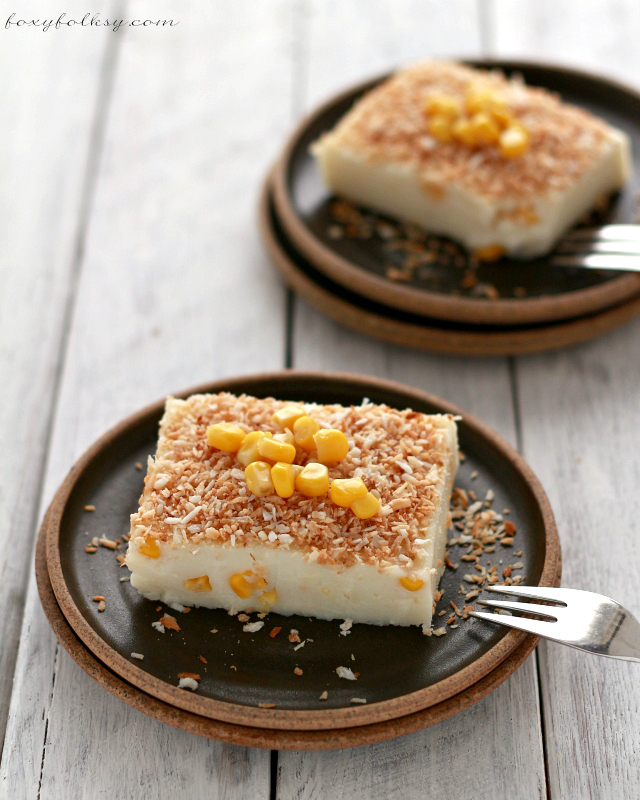 I would love to try this…i never made a maja blanca before. Thanks. Hello po. I made your maja recipe last nite with the help of my 4 year old boy. We all love it. It is the best maja blanca that i ever made. Thank you very much. And thanks for sharing your recipes. The maja turned out delicious! I didn’t know you can even opt out the sugar! I’m glad I tried your recipe. And my Jamaican husband loves it! Thanks for the nice comment and I am glad you and your hubby liked it! just printed some of your recipes and can’t wait to try them all. Hope everything comes perfect.wish me luck. I made this for my birthday tomorrow . Turns out great! I used corn flour instead of cornstarch. It makes difference. My maja becomes softer than the last time I used cornstarch. Hi. I have a question… for the 3/4 C milk used to dissolve the 3/4C cornstarch.. is that in addition to the 1 1/2 C of milk that you listed in the recipe? so total is 1-1/2C + 3/4C milk? Thanks!! Yum! looks so delicious ! I love coconut ! Then you will surely love this coconut pudding Lou! Thanks for dropping by..
Love it! Imiss this food trying to make it lets see i i goes.